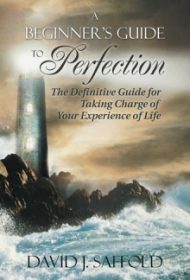 In A Beginner’s Guide to Perfection, David J. Saffold aims to help readers solve personal problems using a method that worked for him. Writing with refreshing honesty, he describes past foibles in his career and relationships that prevented him from being a happy problem-solver at work and a loving partner in a relationship. He reveals his low self-worth—he was, he writes, “the biggest piece of junk God ever created ”— and his struggle with alcohol. But through years of self-study of human psychology, he comes to realize that “As You Believe, It is Done unto You,” a concept he introduces in the title of the first chapter. The narrative’s flavor is Napoleon Hill (Think and Grow Rich) meets Esther and Jerry Hicks (Ask and It Is Given). Christianity is in the mix also, with the occasional insertion of bible verses to validate a point being made. Diagrams are also provided. The narrative flows logically, and while the text can be repetitive, the repetition is useful for underscoring the message. Both the bible quotes and diagrams seem extraneous, however, since the text is clear and imperative.